New funding to help speed up planning decisions and help deliver, quality new homes has been announced by Housing Minister Dominic Raab today (24 February 2018). The first wave of the Planning Delivery Fund, totalling £15.8 million, has been awarded to enable councils to process more applications, implement new reforms and also train planners to tackle the housing challenges faced by their local area. This funding boost will support local authorities working together on ambitious new joint local plans and core strategies, which will engage residents on how future development will take place in their areas and outline the locations suitable for new homes where demand is high. The funding will also support greater best practice and innovation within councils as they decide planning applications, resulting in more being determined over a shorter period of time. 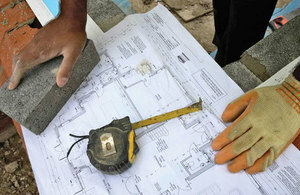 Money awarded to bidders will also allow local authorities to access the latest expertise on design and town planning, driving up the quality of new homes built. "This cash boost ensures councils have the resources needed to make quicker decisions on planning applications, delivering quality housing at a faster rate. "It’s part of our strategy to build the homes this country needs whilst also supporting residents to have their say on the kind of development that takes place in their area." This first wave of funding has been split into 3 streams that will assist in delivering new homes across England: The Joint Working Fund (£9.4 million), Design Quality Fund (£4.82 million) and Promoting Innovation Fund (£1.07 million). The launch of this fund will give successful councils a greater capability to implement the government’s reforms of the planning system and comes as the Ministry for Housing prepares to launch its revised National Planning Policy Framework later this spring. Three third party organisations were also awarded funding: the Royal Town Planning Institute (to provide training bursaries), Urban Design London (to deliver tools and training to increase capacity) and the Gloucestershire Wildlife Trust (to provide a wildlife protection tool). The successful bids make up the first wave of funding is part of the £25 million Planning Delivery Fund. Allocations of the remaining fund for the year 2019 to 2020 will be subject to a further bidding round to be announced at a future date. The Planning Delivery Fund was initially announced in December 2017. The £15.8 million of the £25 million budget was allocated following a significant level of interest being shown by bidders, with 383 applications for funding received before the deadline of 11 January.